Normally when it comes to Mother’s Day, I’m always organised ahead of the game. Mum’s birthday is in late April so normally I do a double-header at the shops and stock up on goodies for both. But this year, I’ve slipped and I’m currently gift-less. 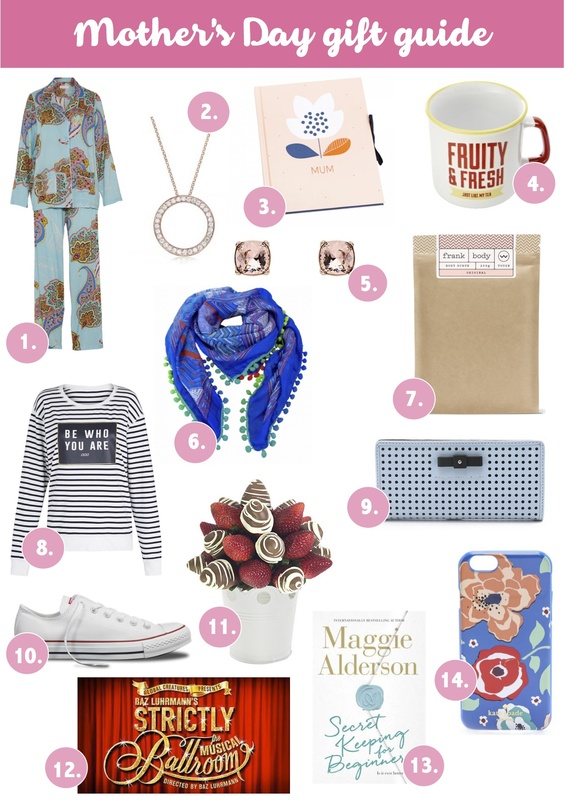 Luckily, there’s 5 shopping days to go so, if like me you’re still looking for ideas, here’s a quick Mother’s Day gift guide to use as a cheat sheet. There are gifts for mums of all ages, and for kids with all budgets! 1. Peter Alexander Paisley Blue PJ Set, $89.95 | 2. Secrets Shhh Circle Of Love Pendant in rose gold, $395 | 3. Kikki K Memory Book, $29.95 |4. Jamie Oliver Drinkware Slogan Mug (available at Woolworths), $6 | 5. Mimco Jewel Stud $79.95 | 6. Charli Bird Yasmine Silk Scarf with Pom Pom Trim, $69.95 | 7. Frank Original Coffee Scrub, $14.95 | 8. Lorna Jane Lily Sweat, $89.99 | 9. Marc by Marc Jacobs Sophisticato Tomoko Wallet, $178 | 10. Chuck Taylor All Star Classic Canvas, $90 | 11. Edible Blooms Mini Strawberry Bloom, $59 | 12. Strictly Ballroom tickets, $50-$135 | 13. Secret Keeping for Beginners by Maggie Alderson, $25 | 14. Kate Spade New York April Multi Floral iPhone 6 Case, $50.26. I hope all the mums have a fabulous weekend. I’m liking the strawberry blooms.